The Chabad Jewish Center of Monroe has opened a religious school for elementary-age pupils, only the second in Monroe Township. Despite the area’s reputation as a haven for retirees, the Zaklikovskys predict there is a need to be filled among Jewish families who have moved into the housing developments that have blossomed in Monroe Township in the past few years. The township public school system serves 4,302 pupils in four elementary schools, a middle school, and Monroe High School, up from 2,577 in 1993. The first township religious school — at the 24-year-old Reform Congregation Etz Chaim-Monroe Township Jewish Center — now has 52 students. According to Rabbi Zaklikovsky, residents have moved into the area for jobs and are often disconnected from family and the synagogues and institutions they grew up in. “We consider this a major achievement that we can tap into Jews who are really far away from their roots and really help them know their heritage,” he said. “It’s an opportunity to give them something new and fresh and give the children individualized attention. This is something the whole family can be part of and grow with — and this is the beginning. Most of the students enrolled participated in a youth program, Youth Zone, held several times last year around the various holidays. 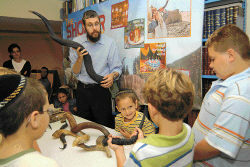 After communicating with the families who participated in that program, Chanie Zaklikovsky said, “we realized that the parents really wanted to introduce their kids to Judaism even though they didn’t know that much themselves. Many of them kept on talking to me about it” after the programs. Chanie, a middle school teacher at the Solomon Schechter Day School of Raritan Valley in East Brunswick, said the Chabad religious school is focusing on such basics as prayer, holidays, and simple Hebrew. Children can also prepare for becoming a bar or bat mitzva by going through the school and then working with the rabbi, who will provide individualized lessons. “We’re here for every child,” said Chanie, who previously taught in Brooklyn and in her native Canada. 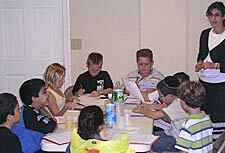 Are there 2 Chabad centers in Monroe?